A message from GOLD Learning! Early Bird Registration is now open with door prize giveaways taking place over the next several weeks. Take advantage of reduced pricing while getting automatically entered for our prize drawings which include iPads, books, gift cards and more. Visit http://www.GOLDLactation.com to learn more. 1) Celebrate IBCLC Day & Earn 1 L-CERP: Unraveling the Mysteries of Human Milk: The Fascinating Role of Neohormones, Epigenetics, the Microbiome and More! by Laurel Wilson, IBCLC, RLC, BSc, CLE, CCCE – Access your complimentary registration here. 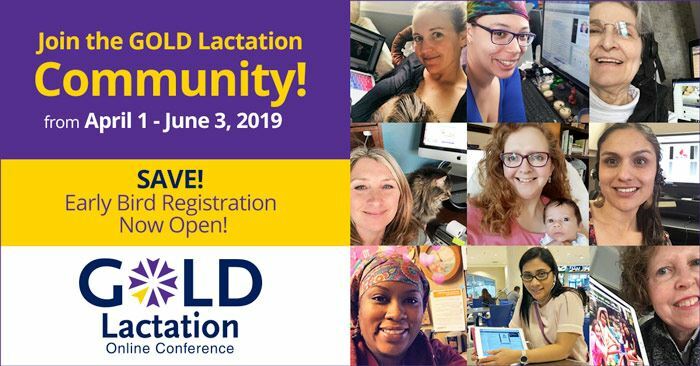 2) GOLD Lactation 2019 Opening Keynote: Does Breastfeeding Protect Maternal Mental Health? The Role of Oxytocin and Stress by Kathleen Kendall-Tackett, PHD, IBCLC, FAPA – Reserve your seat here.